This is my contribution to Scott Thomas’ latest assignment, Hometown History. Thank you, Scott, for this challenge, that kicked me start photographing in my home environment again! 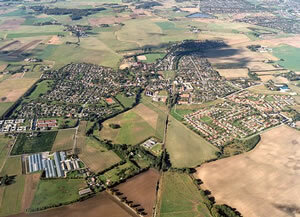 I live in Mårslet, south of Aarhus in Denmark. My home area’s history goes back thousands of years – to the early Stone Age. Here peasants settled more than 5000 years ago! 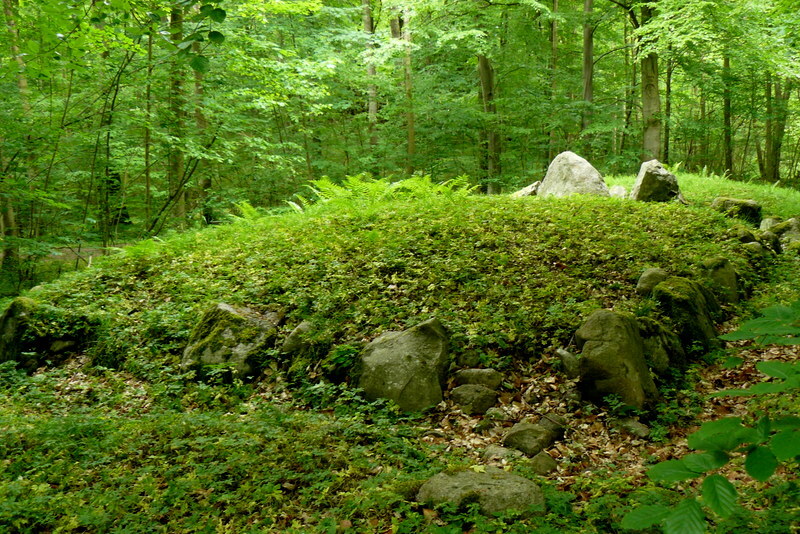 And they submitted their marks in the landscape, which are still visible in several places: In Hørret Forest just east of town you can see this 18 meter long grave. It is a long dolmen, a collective grave, which consists of a stone-built burial chamber surrounded by a mound and a ring of large stones. Here, society’s most affluent members were buried with their weapons, valuables – and plenty of food for the journey to kingdom of the dead! The town name “Mårslet” is perhaps nearly as old as this burial chamber? The name Mårslet is composed of two words: “Morth” (which later became “Mår”) and means “forest”. And “slet” which means “clearance”. Thus does “Mårslet” mean “Clearing in the forest”…. One of the first places you can find the name in writing is from 1360, when it was spelled “Mordslet”. In Mårslet you can see this house – close to my own house. It is the oldest house in Mårslet, built in 1778. 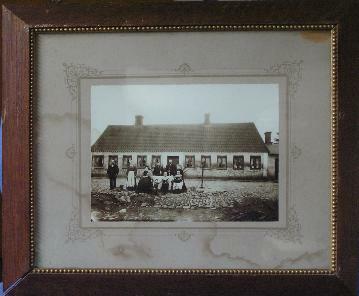 In the archives of Mårslet Egnsarkiv (Mårslet Region Archives)I found this photo of the house from 1900-1930 – with the many residents of the small house out in front of their house……. 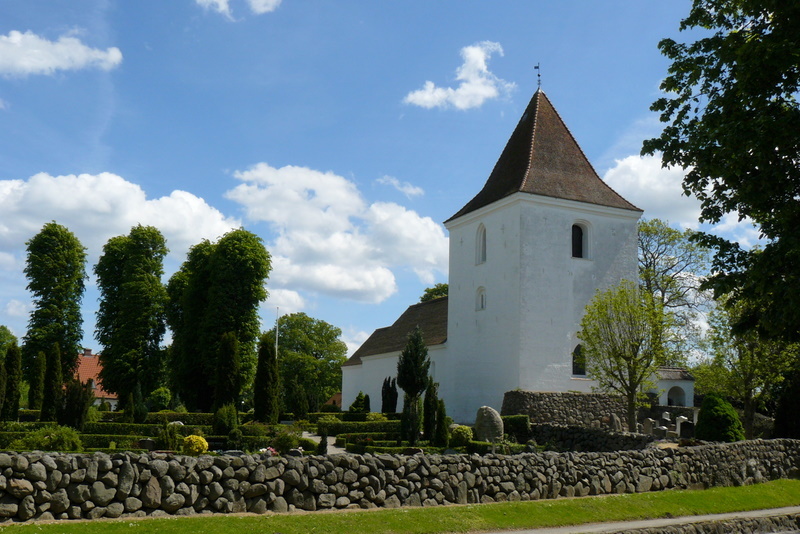 A view of Mårslet Kirke – seen from south-east. 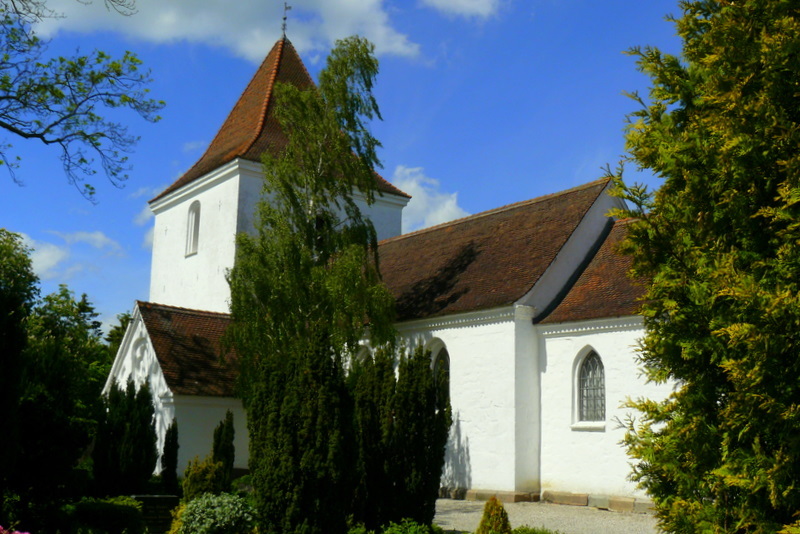 Around 1800 the Church had a lead roof, but it was in 1828 sold by the church owner,The Baron of Vilhelmsborg, who lacked money, and instead replaced it with a the church’s current “roasted beaver tail stones”. 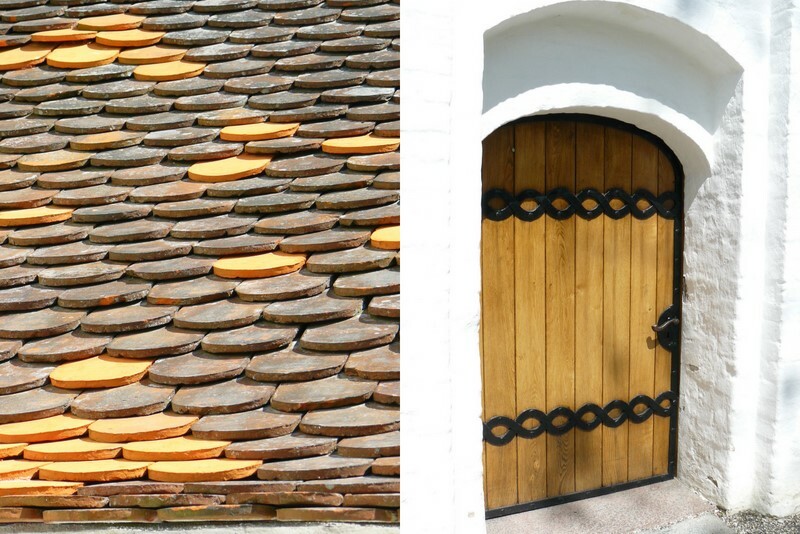 – Mårslet church is now the only church in the country where the entire roof covering consists of these simple but beautiful tiles. I will not mention the interior of the Mårslet Church here. More about this on another occasion. 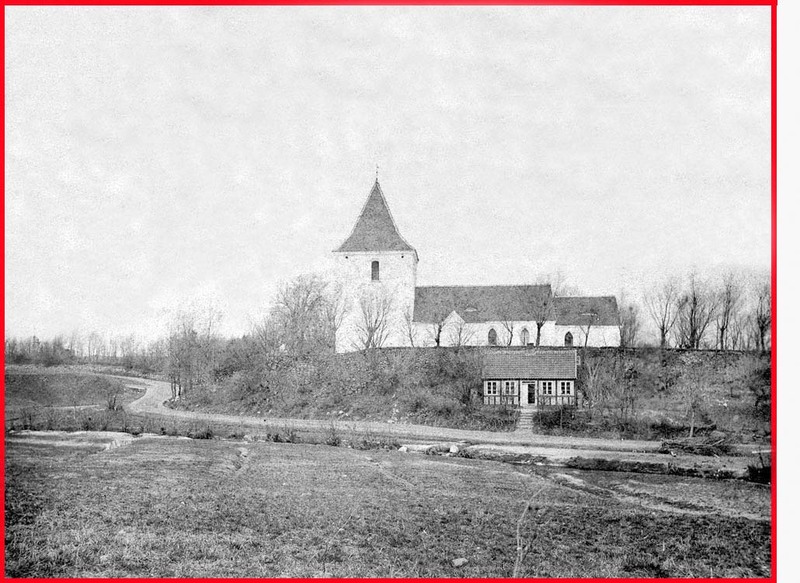 Before leaving the church I will show you this photo of the church from around 1900. It is obvious that the city was then a very small town, as there is only one house near the church…. Thanks again to Mårslet Egnsarkiv (Mårslet Region Archives) and our local historical association, which has made ​​a tremendous amount of work to collect old photos and other information about the town’s history. This is a view of the center of Mårslet. Taking the picture I am standing in front of the church facing the entrance to our small shopping center. 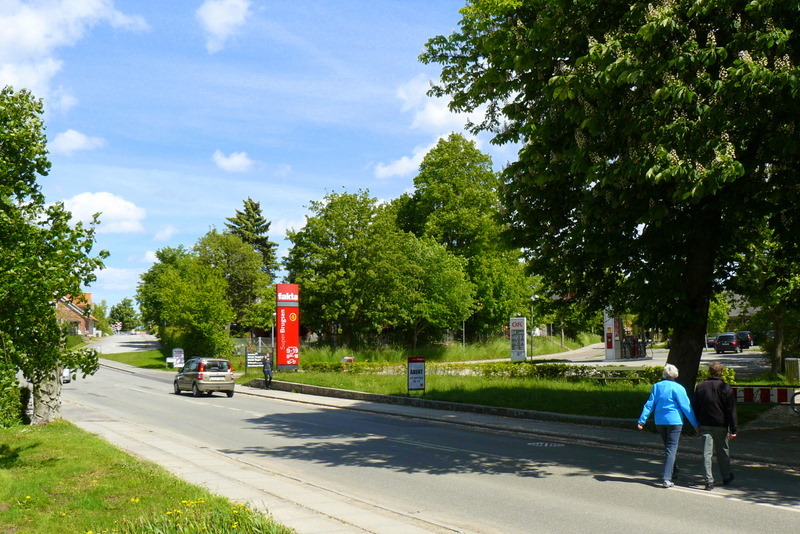 This consists today of two supermarkets, a flower shop, medical center, a dentist and a gas station, the latter is is visible in the picture, the shops are situated further behind the gas station. 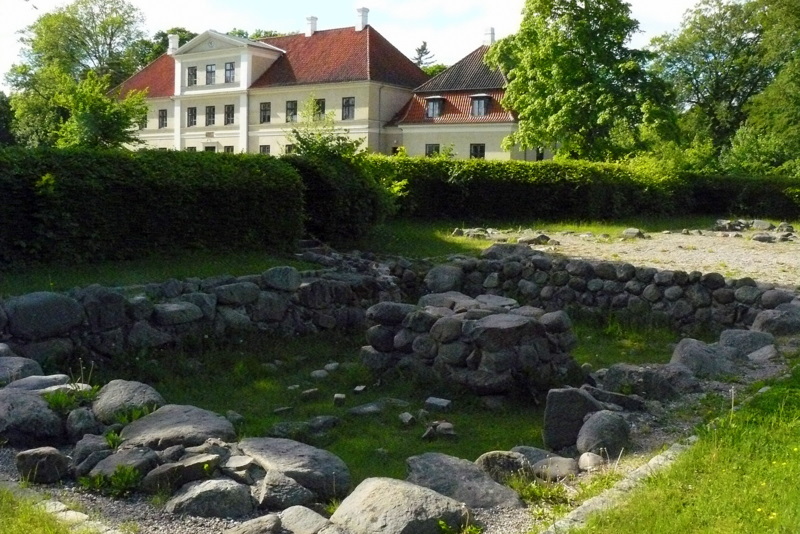 The shopping center is located at the site where a farmhouse, Bomgården, was previously located. 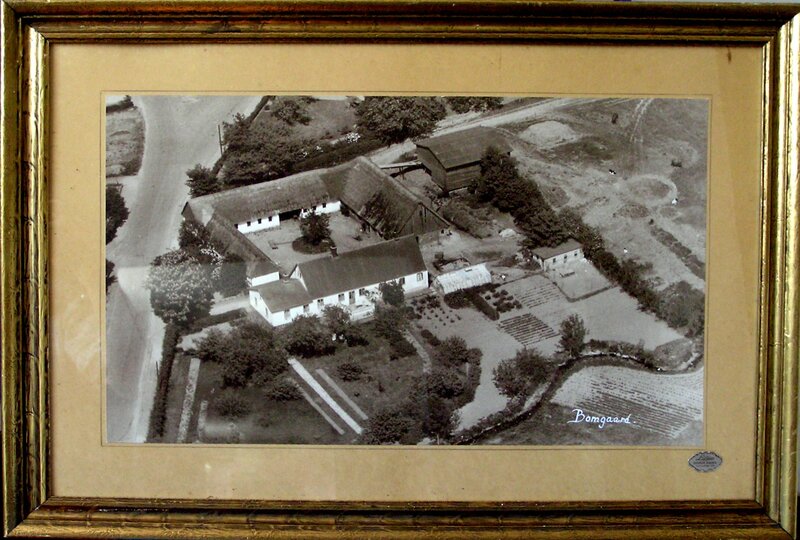 The second photo (below) of Bomgården is an aerial photo – captured in the middle of the last century – not many years before the farm was demolished to make way for the shopping center… One can see the chestnut tree by the road. The main building, the farmhouse, is in the middle of the picture. East of Mårslet are several major forest areas. 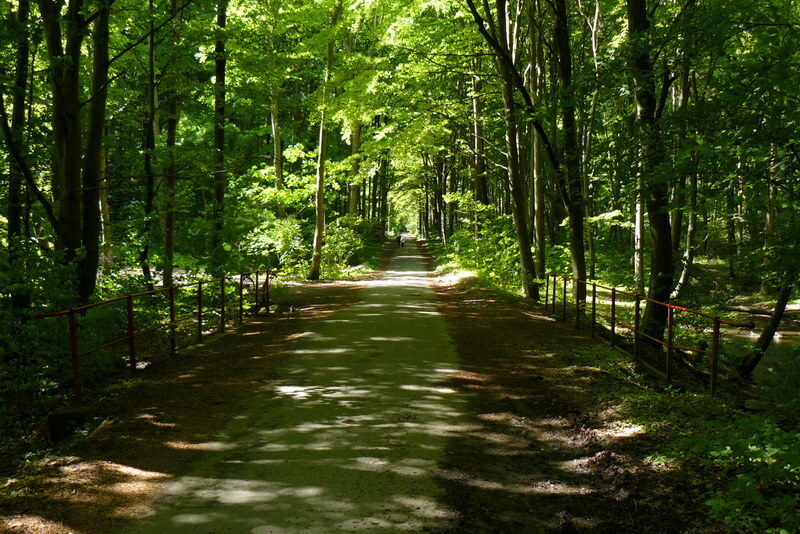 Not far from Hørret Forest, where Stone Age people buried their dead, lies Vilhelmsborg Forest, less than 2 km’s from my home. Readers of this blog will find several photos from there here in the archives of this blog. My next photo is of the Manor Vilhelmsborg’s main building. It is built in 1843. The Manor Vilhelmsborg’s history goes many centuries back. It was founded in 1486, and in the first 200 years the name of the manor was “Skumstrup “. This is a part of the ruins of Skumstrup as they look today. Skumstrup’s main building has been excavated. It has been over two floors with a stair tower in the center courtyard. At first floor was a great hall. There were two side buildings with kitchen and chambers and associated farm buildings. But when Baron Villiam Gyldenkrone in 1673 inherited Skumstrup and moved there with his 13-year-old young wife, he named the manor Vilhelmsborg – after himself … And in these years the manor house was relocated and a new manor built on the current location. 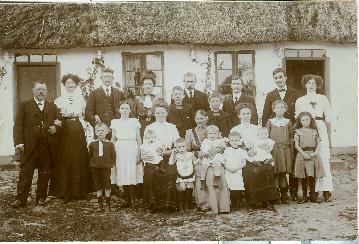 The owners of the property after 1673 can be seen on the memorial board at the front of the picture. Today Vilhelmsborg is owned by the local government in Århus, and it operates today as Danish National Equestrian Centre. One of the guests who often visited the baron at Vilhelmsborg was Hans Christian Andersen. When he stayed there he often went on horse-drawn carriage rides in the area. 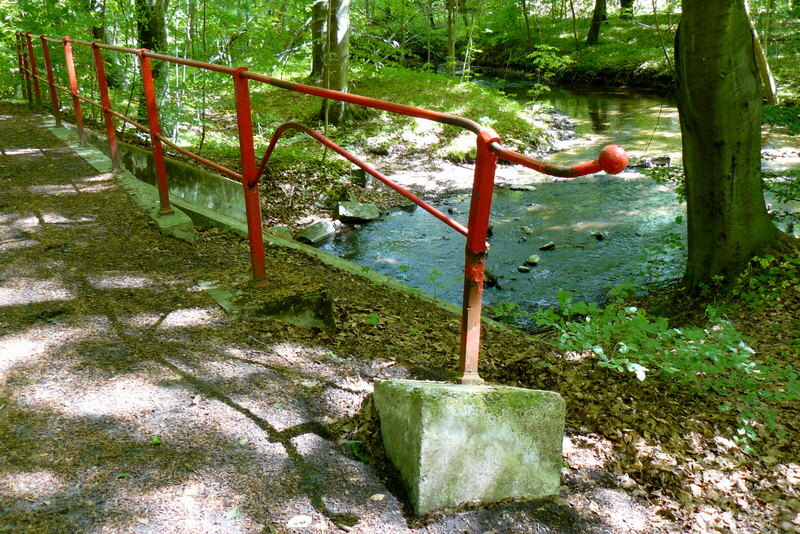 On one of these trips, he tells of a dramatic accident, in which the horse trailer crashes on a bridge in the forest and almost runs into the stream, Giberåen. Luckily none of the passengers in the car were seriously injured…. And Hans Christian Andersen lived for many more years – and told us many more fairy tales after that day! Beautiful!! The woods look so inviting. What a wonderful place to call home! truels, the oldest house looks like something from the children’s book. Is someone living there now? Your hometown has interesting history and love the colors of your photos. Yes, someone is still living in this old house. It looks very well maintained from the outside, and probably also inside? My own house is from 1904, we have carefully renovated the exterior – and completely renovated and converted the interior. It’s actually my grandparents house. They’ve been living there since 1950, thus celebrating their 61st anniversary May 20 this year. My grandfather turned 89 four days later, and besides being somewhat troubled when it comes to walking he’s fit physically as well as mentally. The same goes for my grandmother, who’s 81 years old. What your picture doesn’t show is the 1500 square meters of garden behind the house, which they still manage to keep almost by themselves. Oh, and by the way – the original (!) door will be replaced during this summer. You can just make some of the cracks in the wall out beside it, in your picture. You have so MUCH history over there! That’s what I kept realizing the two times I was in Europe. I guess we really are just a youngster over here! 🙂 Thanks for stopping by my blog! – Dawn King, Michigan, USA. Thanks for your visit here. I have been only once in USA, I loved those two weeks (in California, Arizona, Utah and Neavada) . 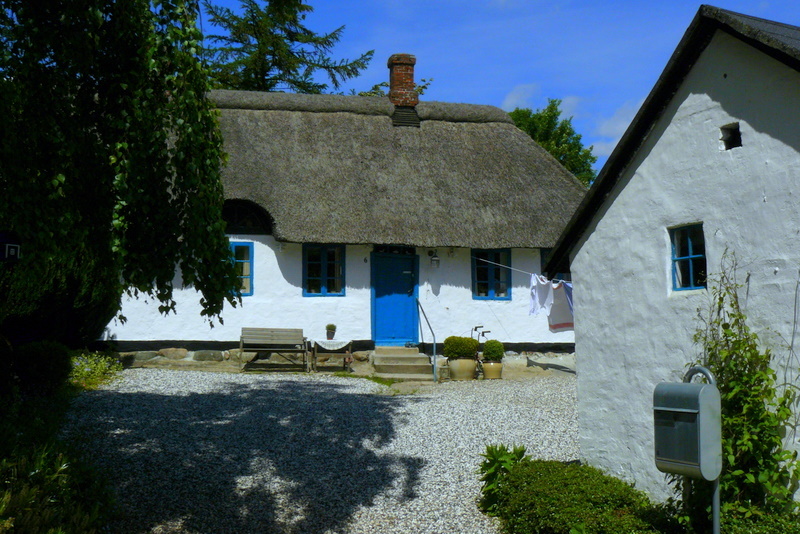 When I settled down to follow the hometown history links it never crossed my mind that I would see a dolmen and roasted beaver tail stones and a lane where Hans Christian Andersen rode–all in one post! What a wonderful visit. Thank you. I’m glad you liked my post. It was really exciting to make this, I discovered even new aspects of the history here. Eg. I found and visited the Dolmen in Hørret Forest, I had not been there on the spot before! I echo Gerry’s words, Truels. You told such a beautiful story of your hometown; I had no idea you had such a long history. I particularly like the church with that remarkable and pretty roof of roaster beaver tail stones, and that photograph of the lane through the forest – magic! Reggie, I appreciate your comments so much! Thank you. How I would love to live in an old town like this. I am envious you live in a house built in 1904 – most homes where I reside are new and boring. If you come over here you could start with visiting the area 😉 – you will be very welcome! This was a wonderful journey through your hometown, truels ! I am impressed by the greenery all around, like a box for a jewel of a little town. You did a lot of interesting research, thank you. This wall surrounding the church, is it a dry stone wall ? Beautiful ! Love the roof detail too. Many thanks for this great post about your hometown. Reading your comment I am glad that I spent a great deal of energy to create this post! Thank you so much, Isa 🙂 The churchyard wall is made of natural stone, it is old and made ​​like it has been a tradition for centuries. Thank you for showing us this! I like your presentation! Ja, bildene av ibisen er tatt i Marokko, Agadir! Ha en flott dag, Truels! Thank you, Hans. I hope you will come again for a visit! Always, Truels…always. You are on my list…! Thank you for sharing this, Truels! I love where you live! 🙂 I love the way you’ve captured this church. Great job! This was a whole thesis, and worth every word and photo in it. My personal favourite among the photos was the roof detail, but the info won! A very good job. PS Jeg følte meg tilbake til mange opphold i egnen. I, too, enjoyed the historical tour of your hometown in Denmark. Beautiful photos. Can you believe the Baron married a 13 year old girl? And I think we’re all happy to hear that Hans Christian Anderson survived the accident! It probably provided more material for his fairy tales. Thanks, Kathy. Much has changed since then -, I think it was more common to marry at that age back then…. Well done Truels. I love Your post. It illuminated to me Your town, so beautiful, environment and history. I am always been interested in history and You gave to a very good lesson in it. The house You showed” lindegårdsvej6” reminded me from my pen pal from Denmark when I was young school boy. I like its style very much. I am happy when I had possibility to read all this. Thank You. Hello Matti. Great that you enjoyed my post about the history of my hometown! Truels, I love reading about your local history. Buildings are not constructed so strong around here. Love the roof details, makes a great abstract. You put a lot of research into this one. I enjoyed reading it and learning about my fairy tale favorite Hans Christian Andersen. Knowing the history behind the hometown can help one feel connected to it. Thanks for sharing. “Life must be understood backwards – but lived forwards”! I found it very interesting to read all about your town. It is very beautiful and you have presented it well. What a wonderful tour this is. Educational and lots of very nice photographs to share your beautiful part of the planet. Thank you! Have you been living in Mårslet?! And yes – I’m sorry! – I forgot the baker and the physiotherapist! Yes, I’ve lived in Mårslet for a few years now. Thank you for producing such a fine presentation of our community. An interesting assignment and I believe you deserve an A+. What a beautiful and fascinating place that you call home. Thanks for your nice evaluation – and yes, I’m really happy to stay here in Mårslet! I find it interesting, that even a small town like mine has so much history to find – when you look. I’m glad you liked it! Interesting story about your family! I know several people in Hørret. What is the name of your uncle here?